James Walker McNew was born in Indianapolis, Indiana, on January 31, 1949. He graduated from the University of Kentucky with a double-major in Political Science and History. He then attended and graduated from the Indiana University School of Law in Indianapolis, Indiana. Jim was admitted to the Indiana State Bar in 1976. From 1976 through 1979, Jim was a Deputy Prosecutor in the Major Felony Division of the Marion County, Indiana, Prosecutor’s Office. In 1981, Jim became the Trial Supervisor with the Lake County, Indiana, Prosecutor’s Office, where he worked until 1989. 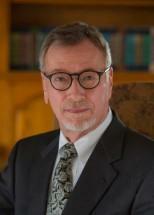 In 1989, Jim moved to Greenfield, Indiana, and joined the firm of Brand & Allen as a criminal defense attorney. In 1999, the firm was renamed Allen Wellman McNew, and then in 2014 changed to Allen Wellman McNew Harvey, LLP. Jim practiced law as a partner of the firm until his death. Jim passed away peacefully on December 7, 2018, following a battle with cancer. Jim was a champion of criminal justice rights and a firm believer in the rule of law. As a young deputy prosecutor, Jim was the lead trial attorney in the successful prosecution of Paula Cooper, who at age 16 was convicted of the murder of an elderly woman in her home. The case received international attention when the Lake County Prosecutor decided to seek the death penalty, which was an option under Indiana law at the time. Jim also represented the State in the death penalty phase of the case, and Paula was sentenced to death. Paula Cooper’s death sentence was reversed by the Indiana Supreme Court. The Court held that Indiana’s death penalty statute, without a minimum age, was unconstitutional. Cooper v. State, 540 N.E.2d 1216 (Ind. 1989). The case thus became the change-point in protecting minors from the death penalty in Indiana. Although Jim did not personally believe, at the time, that minors who committed murder should be subject to the death penalty, Jim accepted his role to represent the State of Indiana based upon the status of the law as it applied to that case. The Paul Cooper case exemplified Jim’s respect for the law as it applied to his cases. After moving into private practice as a defense attorney, Jim worked diligently to see to it that his clients received a proper and effective defense – regardless of the extent to which their financial resources would provide for such representation. Jim also pursued changes in the law through the appellate process when the opportunity arose to do so. Jim appealed the case of Danielle Kelly v. State of Indiana, 997 N.E.2d 1045 (Ind. 2013) to the Indiana Supreme Court, where he presented oral argument on behalf of his client. As a result of that case, the Indiana Supreme Court provided clarification on the matter of a person’s Miranda warning rights. The decision strengthens protection of the constitutional rights of Indiana citizens in the context of an arrest. Jim also gave back to and supported law enforcement in Hancock County. At the time of his death, Jim was a member of the Hancock County Sheriff’s Merit Board, serving on the Board since 2014. Jim also assisted the local judiciary, serving as judge pro tem in all of Hancock County’s courts on a regular basis. Jim was recognized within our firm and in the Hancock County Bar as a mentor for young attorneys learning the practice of criminal defense. Several attorneys in our firm have benefited greatly from his teaching. He was a highly respected member of the Hancock County Bar Association. In June, 2018, the Hancock County Bar Association recognized Jim’s skills as a trial attorney by presenting him with the James L. Brand Trial Advocate Award. Jim was a wonderful person and law partner. He had a keen intellect, and a commanding presence in the court room. He leaves our firm with a remarkable legacy. Allen Wellman McNew Harvey, LLP, serves clients in Greenfield, New Palestine, Indianapolis, Hancock County, Marion County and throughout Indiana in local, state and federal courts.